Energy-Efficiency. The (Undiscovered) Instant Edge For Homebuilders | ASTRALCOM - Content Strategy, Conversion Marketing and Customer Acquisition. Most homebuilders basically have five main areas in which they can differentiate themselves from their competitors. Maybe you’re a builder that competes on price, or one that competes on “included items.” But there is one competitive differentiator that most builders have not leveraged in ways that demonstrate real and enduring value to their potential homebuyers. Energy-efficiency is often cited as the second most important aspect of buying a new home. Depending on where you live, it can be the single most important factor that new home buyers require. It makes sense when the cost of utilities are an ongoing expense for every homeowner. That’s why things like ENERGY STAR, Environments For Living and the HERS Index exist. Today, homebuilders have incorporated the HERS Index, whereby homes now also have a HERS score between 0 and 150. It’s similar to the MPG index for automobiles and for good reason. Aside from the obvious conservation and environmental benefits, homebuyers want to know how owning an energy-efficient new home will affect their bottom line. Demonstrating real savings when comparing homes is easy with the HERS Index. For example, by doing a little math and wrapping it in a creative application, you can quickly demonstrate true value and create an engaging, personalized user experience. Check out how H&H Homes leverages their HERS Index as a competitive differentiator, creates an engaging experience and helps demonstrate real savings, unique to each homebuyer. In the case of H&H Homes, if my family spent $300 a month on typical utilities and the new home I was looking at scored 67 on the HERS Index, I’d save around $150.00 a month, or a sizeable $1,800.00 per year. 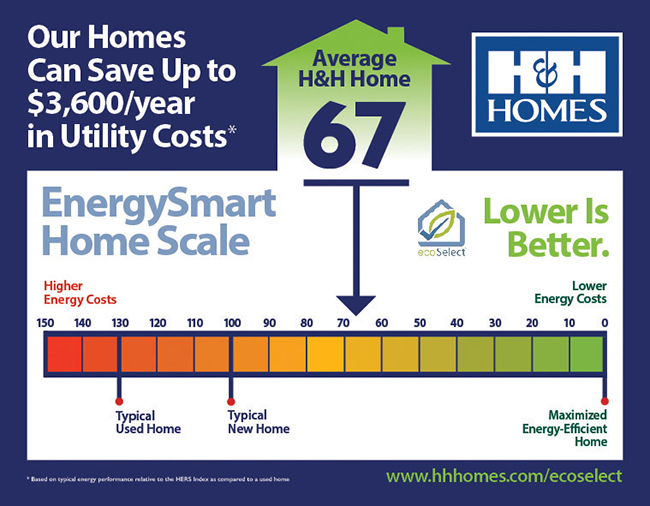 How much a family spends on monthly utilities will affect how much they save with a HERS-rated home. By leveraging a competitive differentiator like energy-efficiency, creating an engaging or inspiring experience around that differentiator and by demonstrating value, homebuyers will remember your brand over competing ones that can’t deliver the same experience. Creating smart, engaging user experiences like these energy-efficiency and mortgage calculators is a great way to connect with customers. Try adding ours to your website, for FREE. Or, contact us to discuss creating a custom widget for your website or social pages.